Most Common Chronic Disease of Childhood – Help Spread The Word! 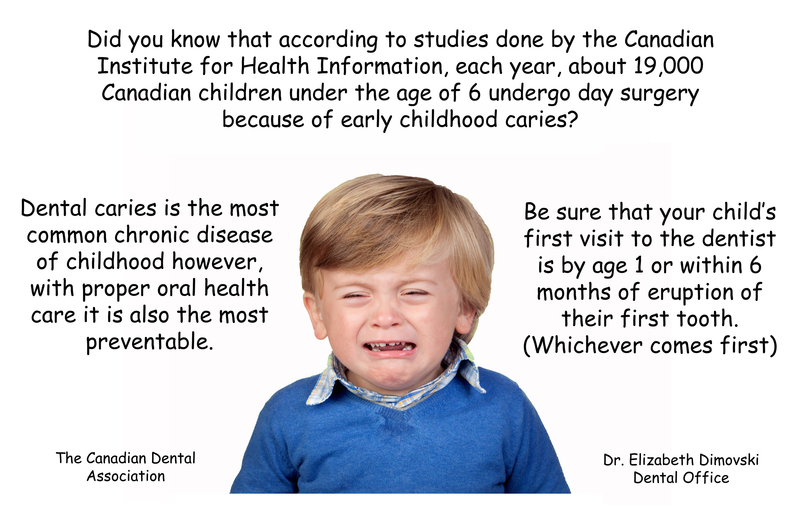 Did you know that according to studies done by the Canadian Institute for Health Information, each year, about 19,000 Canadian children under the age of 6 undergo day surgery because of early childhood caries? Dental caries is the most common chronic disease of childhood however, with proper oral health care it is also the most preventable. This entry was posted in Baby's First Dental Visit, Caries in Children and tagged Canadian children, Canadian Dental Association, Cavities in Children, chronic disease, Dental caries, Dentists Brampton, early childhood caries, Elizabeth Dimovski & Associates, Filling Baby Teeth, Kids Dentists, Most Common Chronic Disease in Children, oral health care, the Canadian Institute for Health Information by Lifeology 101. Bookmark the permalink.